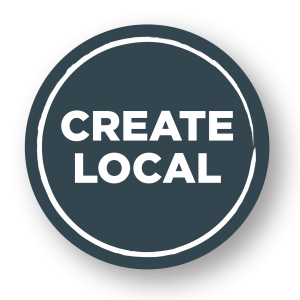 The Creative Arts Initiative connects business members with the local creative arts community in order to build the Creative Artisan Economy. It supports business growth and the local economy, provides living wages to local artists, increases beautification efforts, and helps to grow a thriving arts district and artisan community in Durango. 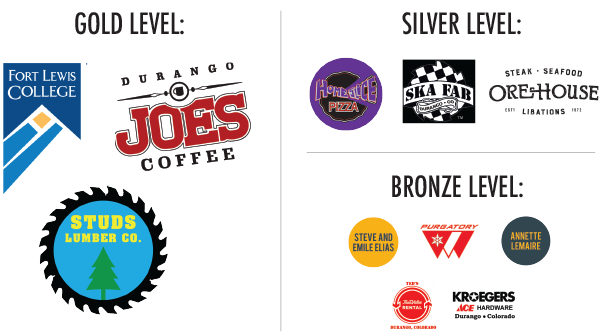 This initiative builds on the strong foundation of the City of Durango Creative Arts District and increases the multiplier effect by working with independent local businesses, keeping money in our community. Check out our Creative Projects! This project was made possible by the Durango Creates!, awarded by the City of Durango’s Public Art Commission. Completed in November 2018 by artists Hayley Kirkman, Lexis Loeb and Matthew French-Holt. 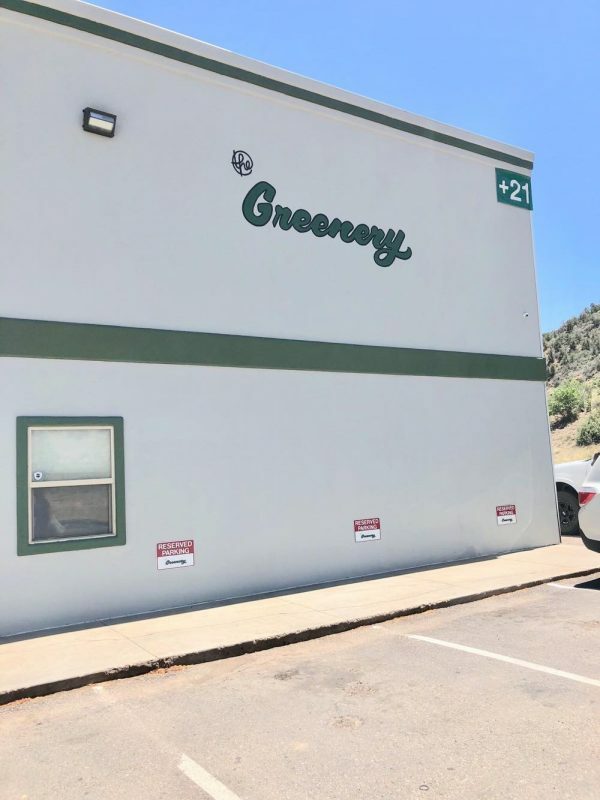 ABOUT THE PROJECT: Local First worked with Faith Frazier, chief marketing officer of the Greenery marijuana shop, to paint the company’s logo on the second story exterior of their building. Together, Local First and the Greenery were able to project and stencil the logo on butcher paper, outline on the wall, and fill in with paint! Artists Hayley Kirkman and Soma Smith painting the Greenery’s logo on the side of their building. ABOUT THE PROJECT: Exhibition artist/Durango Arts Center volunteer Michele Sensing approached Local First to hand-letter a poem that would be displayed in the DAC’s exhibition, “The Wall”, a floor-to-ceiling collaborative gallery installation exploring the implications of creating barriers. The theme of Walls as Barriers has been a year and a half in the making, and features six visual artists in the space and several performance artists during the reception on May 4th. Michele chose to have local artist Hayley Kirkman paint the poem on the wall because it was “more interesting” and engaging instead of just printing it on. 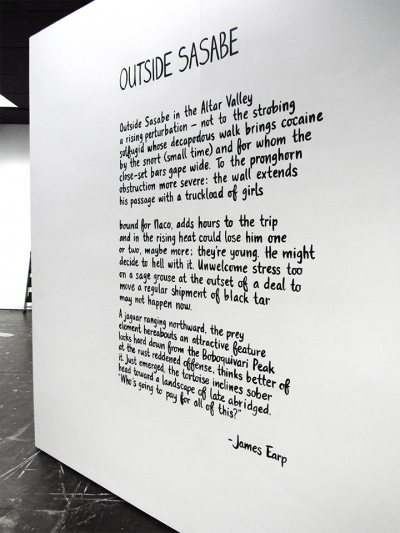 She hopes the hand-lettering will bring more exposure to the poem and the contribute to the show’s overarching theme. Artists from the Durango Joe’s mural project (from left): Dakotah Andreatta, Allie Wolfe, Hayley Kirkman. Not pictured: artist Sarah Sturm. 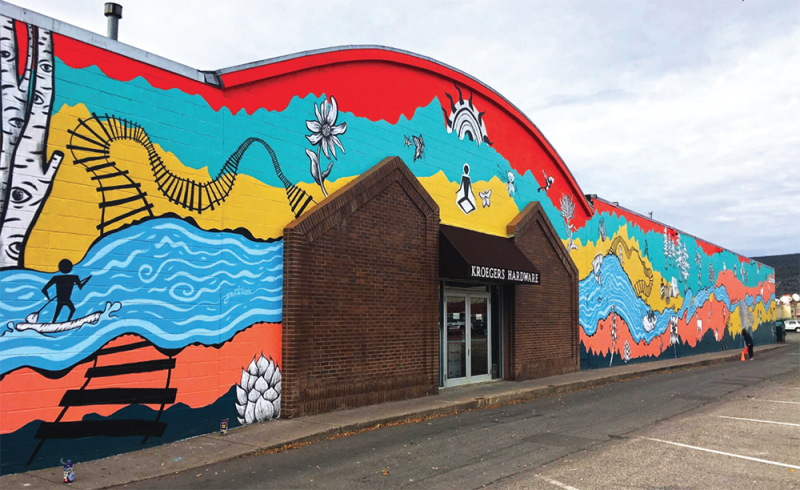 ABOUT THE PROJECT: Local First worked with the creative arts and business community to design and install this mural. 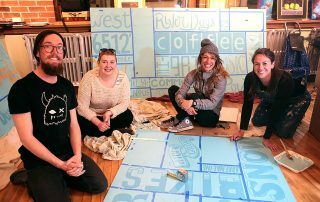 Through creative expression and engagement with our local, independent business community, we aimed to educate the public about the importance of building a strong, local economy while celebrating artistic expression in a manner that explores the history and uniqueness of Durango and La Plata County. The theme of our first mural was “Local is the Way!”, and it aimed to promote buying local, eating local, and being local right in the heart of downtown. This building is the gateway to downtown from Fort Lewis College and will be an exceptional opportunity to educate our community and visitors about our community’s support of the local economy as they enter Durango’s unique downtown district. 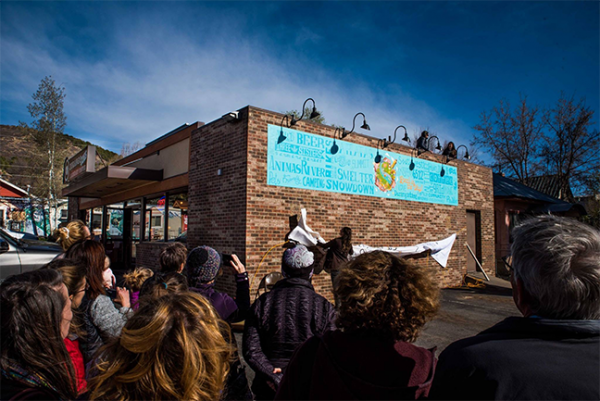 Durango Joe’s Mural unveiling party on March 14, 2018. Photo by Trevor Ogborn, Durango Joe’s. The artists working on the mural in February 2018. From left: Dakotah Andreatta, Allie Wolfe, Sarah Sturm, and Hayley Kirkman. Photo by Jennaye Derge. Musicians performing at an Elegant Evening at Eolus, an iAM Music Institute fundraiser in partnership with Local First. 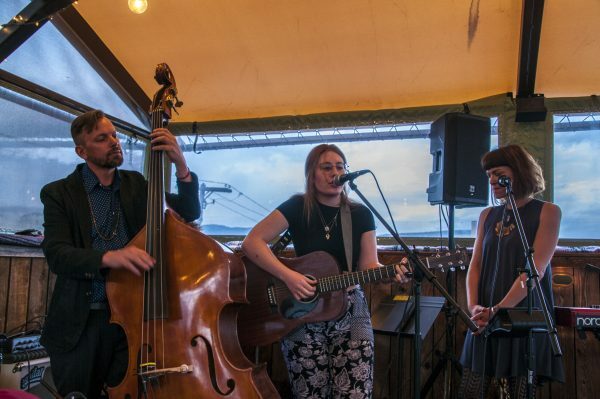 ABOUT THE PROJECT: Local First partnered with iAM MUSIC Institute to create a benefit fundraiser towards supporting student lesson scholarships, the iAM outreach programs and general operations of the school. 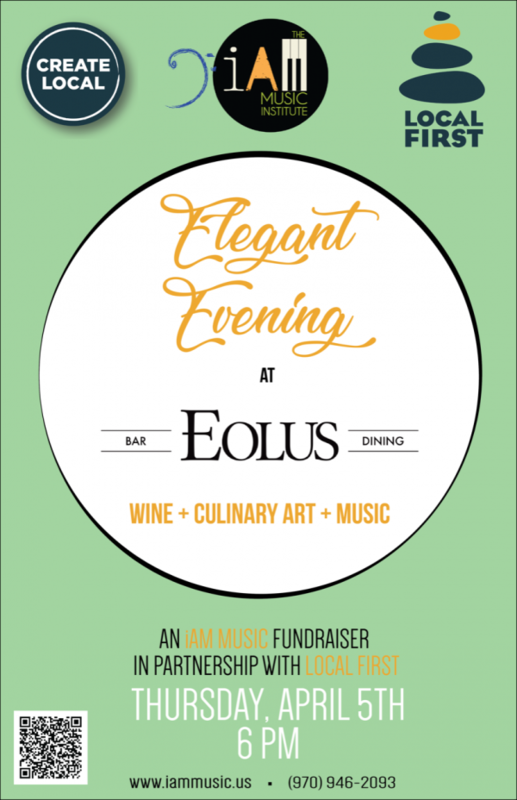 We asked the community to join us for a 3-course experience plus wine and music at Eolus Rooftop. In attendance were the iAM MUSIC Founders, Board of Directors & Staff, as well as the Managing Director of Local First. Event poster created by iAM Music Institute.